Joan I (14 January 1273 – 31 March/2 April 1305), (Basque: Joana I.a Nafarroakoa) the daughter of King Henry I of Navarre and Blanche of Artois, reigned as queen regnant of Navarre and also served as queen consort to Philip IV of France. 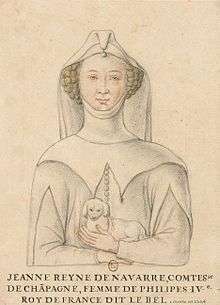 At the age of 11, Joan married the future Philip IV of France on 16 August 1284, becoming queen consort of France in 1285 a year later. Their three surviving sons would all rule as kings of France, in turn, and their only surviving daughter, Isabella became queen consort of England. Joan never visited the Kingdom of Navarre, which was ruled in her name by French governors appointed first by her father-in-law and then by her spouse in her name. The French governors were extremely unpopular in Navarre and her absence from the country was resented: however, it was the French who were blamed for her absence rather than her, and the loyalty to her right to rule was not questioned; rather, it was emphasized in Navarre that it was in fact she rather than the French who was their sovereign. From afar, edicts were issued in her name, coins struck in her image, and she gave her protection to chapels and convents. She never came closer to Navarre than to Carcasonne in 1300, and her spouse was somewhat blamed for this. Joan was much more directly active as countess of Champagne. While being a county rather than a kingdom, Champagne was much richer and more strategically important. Philip IV appointed her administrators, however, Joan visited Champagne regularly and are recorded to have participated in all duties of a ruling vassal and is not regarded to have been passive but an active independent ruler in this domain. In 1297, she raised and led an army against the Count of Bar when he rebelled against her by invading Champagne. This was explicitly in the absence of her spouse, and she personally brought the count to prison before she joined her spouse. She also personally acted in her process against Bishop Guichard of Troyes, whom she accused of having stolen funds from Champagne and her mother by fraud. 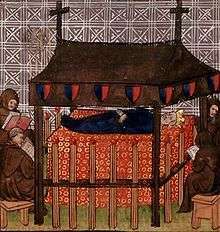 Joan died in 1305, allegedly in childbirth, though one chronicler accused her husband of having killed her. Her personal physician was the inventor Guido da Vigevano. ↑ An annotated index of medieval women. Markus Wiener Publishers. 1992. Retrieved 2010-03-25. 1 2 3 Woodacre 2013, p. 39. ↑ Woodacre 2013, p. 25. ↑ Woodacre 2013, p. 29. 1 2 Woodacre 2013, p. 42. 1 2 Woodacre 2013, p. 43. ↑ Woodacre 2013, p. 35-36. 1 2 Woodacre 2013, p. 40. 1 2 3 Woodacre 2013, p. 37.